With Silas Allard's appointment, the Center for the Study of Law and Religion's current directors intend to begin building the next generation of leadership for CSLR. 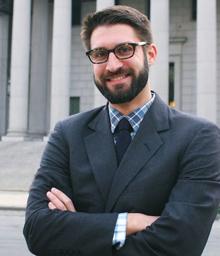 Emory University's Center for the Study of Law and Religion (CSLR) has named Silas Allard, an award-winning alumnus of its joint degree program in law and religion, as associate director, to begin in August 2013. Allard is charged with leading CSLR, a world-renowned research center that has been a catalyst for global expansion of law and religion studies during the past 30 years, into the next generation of scholarship. Among Allard's primary roles will be to widen CSLR’s religious scope beyond the three Abrahamic religions to include Buddhism, Confucianism, Hinduism, Sikhism, Taoism and Indigenous Religions. He also will help CSLR bridge its theoretical, historical and comparative work into hands-on, practical and community outreach work.